Welcome to the Sportsturf Scoop! These 15 minute videos focus on both natural and synthetic turf management and offer practical information for field managers. Stay tuned to our Web site, check out our Facebook page and follow us on Twitter for news of upcoming editions of the Sportsturf Scoop! Can turf-type tall fescue be established on an athletic field during the summer and be ready for fall play? Is perennial ryegrass a better choice for summer establishment? 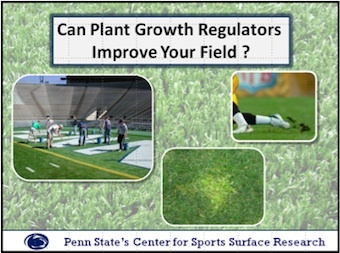 Find out the details of our study that focused on turf-type tall fescue use on athletic fields. Synthetic Turf and Staph Infections - Cause for Concern? Staphylococcus aureus is a common bacterium found on human skin that typically causes relatively minor, treatable skin infections. However, commonly used antibiotics are ineffective against methicillin-resistant S. aureus (MRSA) isolates. MRSA can cause serious infections and result in severe health complications. This addition of the Sportsturf Scoop examines the potential role of synthetic turf in athletes contracting skin infections caused by S. aureus . In the past, synthetic turf was blamed for contributing to athlete injuries. 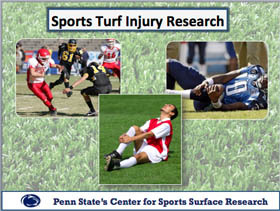 But, as synthetic turf has evolved into a surface that more closely resembles grass, has injury risk changed? In this edition of the Sportsturf Scoop, we look at the latest research comparing injury rates on infilled synthetic turf and natural grass. Gmax is one of the most commonly tested characteristics of athletic fields. But, what does a Gmax test tell us? What is the science behind the testing? In this edition of the Sportsturf Scoop, we address those questions and more as we breakdown the process of this important test. This edition of the Sportsturf Scoop examines one of the biggest issues with synthetic turf – high surface temperature. In this video, we look at reasons why these surfaces get hot and under what weather conditions peak temperatures are reached. 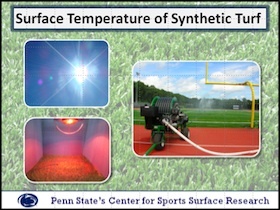 We also focus on the effectiveness of attempts to reduce surface temperature along with current research we are conducting here at Penn State. We know plant growth regulators (PGRs) are used regularly on golf courses – but can they help your sports turf? In this edition of the Sportsturf Scoop, we look at a number of ways PGRs can serve as a tool for sports turf managers.